Comedian, friend and fellow Astoria resident Ted Alexandro decided to take part in the Occupy Wall Street protests at the beginning of this week, and after spending close to 10 hours down there on Monday, headed uptown to perform at the Whiplash show Monday night at the UCB Theatre. He tried to relate this fresh experience into words, and eventually some comedy, because what’s going on is important and young people — the types of people who fill the UCB Theatre night-in and night-out for their free or almost free comedy shows — need to know what’s happening. Actually, we all need to realize what’s happening around us, and it’s often the comedians first who shake us out of our daze and remove our blinders to the insanity of reality. Participate. Lend your voice, your spirit, your physical being. Artists, this is a call to arms. Use your unique gifts to awaken the masses. Your imagination is an invaluable tool to express truth in new and surprising ways. Articulate your truth, your outrage, your disappointment, your hope, in your way. Then I went down to the demonstrations, painted it on a pizza box and held it aloft on Broadway. 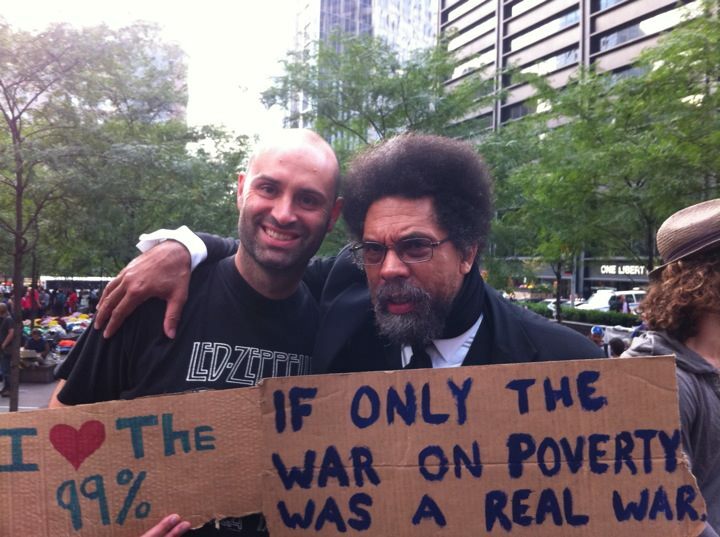 Then Dr. Cornel West showed up, hugged me and I handed him the sign. He said “Amen, brother” and held it, standing beside me and other protesters. Now that picture and those words have gone around the world. Participate. Bring your unique spirit and gifts and sound the call. In doing so, you will awaken others. Participate. Bring friends. Make friends. Thanks, Ted. Fun fact: I enrolled in a seminar with Dr. Cornel West during my undergrad days in Princeton. Solid then, solid now. Amen, brother. The New York Nightlife Awards are not the MAC Awards, nor are they the ECNY Awards. Niches!